A woman is suing Duane "Dog" Chapman and the Arts and Entertainment Television network after one of Chapman's bounty hunting pack allegedly threw her down a flight of stairs during filming of an episode of Chapman's cable television reality show, fracturing two of her vertebrae. 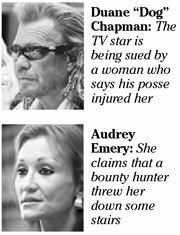 "Dog the Bounty Hunter" is one of A&E TV's most popular shows. The alleged incident happened Jan. 26, 2005, and the episode already has aired more than once. Audrey Emery filed her lawsuit last week. "Tim, I guess Dog's brother, when he barged into the house without my permission, came up to the top of the stairs and he grabbed me by my neck and by the lapel of the jacket I was wearing," Emery said. "And then he twisted me and threw me down the stairs." Emery said she continues to receive treatment for her injuries. She said Chapman's crew also damaged her home and her daughter's bed and toys. And she said she and her children continue to be shown on the television show and DVDs for sale without their permission. Tim Chapman -- no blood relation -- is Duane Chapman's hanai brother. He; Duane Chapman's son Leland; Duane's wife, Beth; and Chapman's Da Kine Bail Bonds company are also named as defendants in the lawsuit. In a written statement, Duane and Beth Chapman said, "Our family has become the target of frivolous lawsuits and publicity-seeking attorneys. We pride ourselves in making sure that everything we do is within the bounds of the law, and we are confident that we did so in this case." Chapman and crew were after Emery's boyfriend, Stuart Calistro, who is also a plaintiff in the lawsuit. Calistro was out on $25,000 bail, posted by Da Kine. The Chapmans said they apprehended Calistro because his mother, who was the co-signer of the bond, specifically asked them to revoke her son's bond. Calistro was awaiting a hearing to revoke his probation for a 2003 carjacking and sentencing for a 2004 burglary and possession of methamphetamine, cocaine and illegal drug paraphernalia. There were no warrants for his arrest. Emery's lawyer, Richard Turbin, said Calistro was not a flight risk because he was still recovering from two broken ankles he suffered in a construction accident. However, state law allows bail bond companies to relieve themselves of bond at any time by turning in the person for which it was posted to police or state sheriffs. That would change under a bill pending in the state Legislature. The bill seeks to regulate the largely unregulated bounty hunting industry and require a person to commit a violation before he can be recalled from bail.